Get an organized physician database full of the doctors who would be most interested in your product. 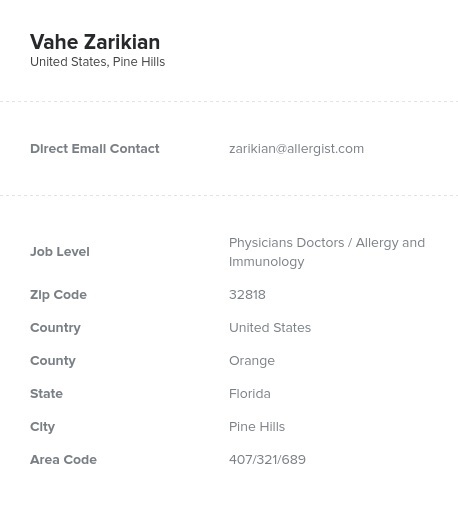 This is a mailing list of physicians with the specialty of allergy and immunology. Find those with biomedical expertise in the immune system now! Common allergies and immune system issues plague millions of patients. Many of those with more severe or irregular symptoms visit allergists and immunologists. Email lists from Bookyourdata.com allow you to reach out to these specialists, so if you have a medical device, piece of equipment, recommended allergy pharmaceutical, or other important medical product that's relevant to them, let them know using this list. Allergists and immunologists have a lot of procedures that they can do to help their patients, from skin-prick testing to find the cause of an allergy to pulling bone marrow samples to recommending the best over-the-counter or prescribed allergy medications. Tell them if you have a pharmaceutical, new technology, or device that's relevant to them, or simply network with this vast and spread-out group of specialists. By pulling the information of doctors into one consolidated specialty database, this tool can help you make connections faster and more efficiently. This pre-built, ready-to-download data product contains all of the information of allergists and immunologists that you need to have that conversation: emails, phone numbers, postal addresses, titles, names, and more! Download this list within minutes and get started with your medical marketing campaign. Connect with allergists and immunologists with this contact directory.